Home » 5 Freshest » “Box of Boogers”. Need I say more? 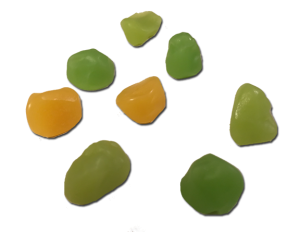 The Jelly Belly folks make a BeanBoozled box with flavors like Dead Fish, Spoiled Milk and Stinky Socks and it’s part of a game to dare people to eat these truly blechy flavors. You can read our review – the flavors are uncannily and grossly right on. Jelly Belly raised the bar ridiculously high on the yucky candy scale. — then they better live up to it. Alas, these do not. 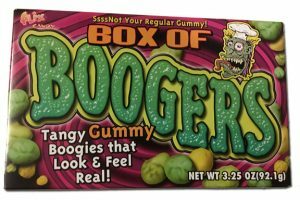 They don’t smell like boogers (though I’m not sure what boogers smell like), they don’t taste like them (again, not entirely sure what they taste like since it’s been at least 40 years since I think I would have done that) and they don’t look like them – way too big and the wrong color. So if these aren’t going to try and be boogs, then what are they going to be? Eh. Not true. No need to pick these Box of Boogers off the shelf.